After one of the coldest, wettest winters in recent memory, we've all been more than ready for spring to arrive! 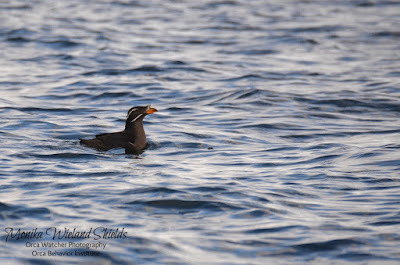 I had to send my camera off for some maintenance, so was worried the nice weather, spring migrants, and whales might start to show up while I was unable to document them! As luck would have it, I was down and out with the flu and there were many rainy days while my camera was gone, so I didn't miss much. 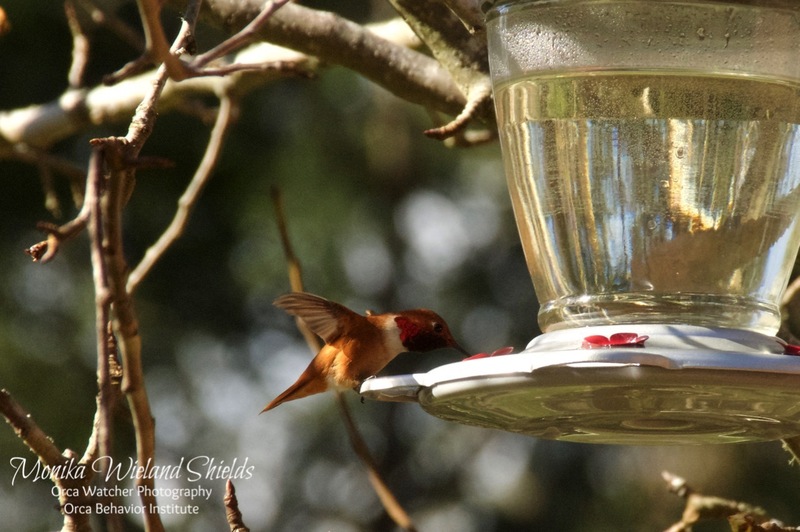 A few spring migrants did begin to arrive, but Jason let me borrow his camera for our photo year list challenge. 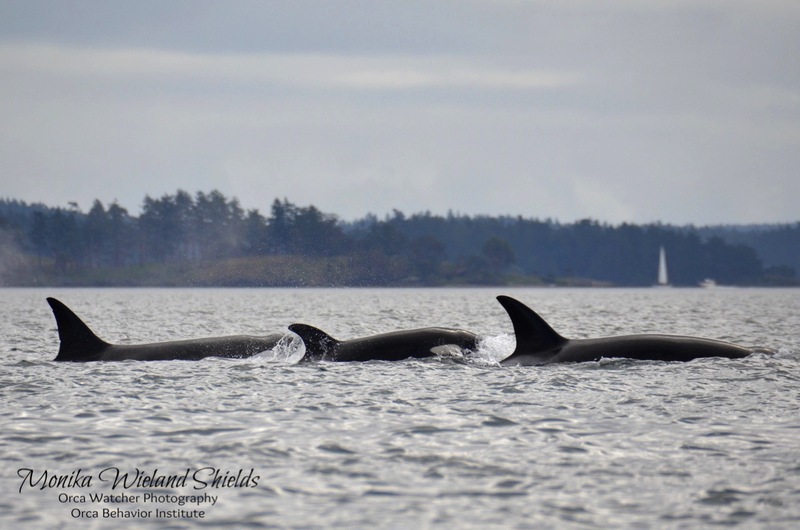 Thankfully, my camera returned in time for this weekend, because this morning for the first time in way too long the conditions were right to hop on the boat and see some whales! We met up with the T36s and T46s near Waldron Island and followed them over towards San Juan Channel. They were in quick travel mode until they reached O'Neal Island in San Juan Channel, when they suddenly fanned out and presumably made a kill, as they started circling and becoming more active at the surface while gulls came down to partake in the feast. 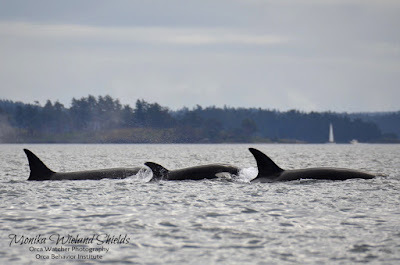 Meanwhile, we saw some other boats further south in the channel and soon saw blows - they were with a second group of whales, heading towards us! What followed was the closest thing to a transient "greeting ceremony" that I've ever seen - the group we were with lined up at the surface, hanging there as the other whales (later determined to be the T99s) approached. 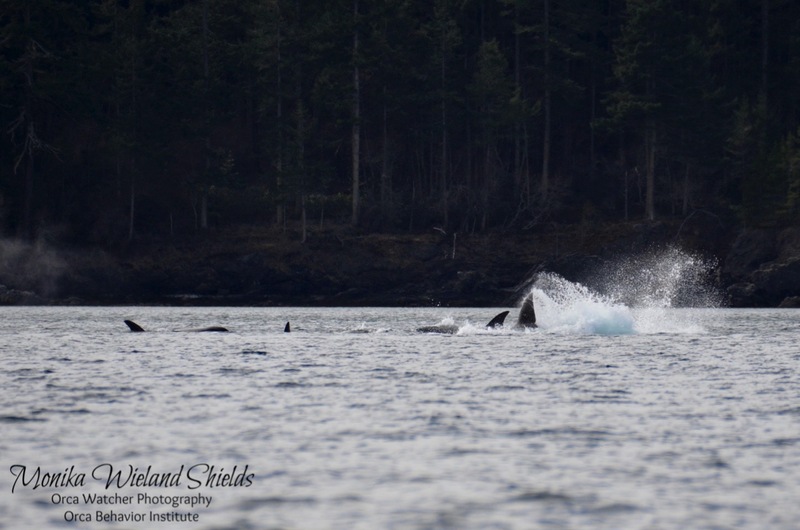 The two groups briefly faced each other about 20 yards apart, and then the surface erupted with breaches, cartwheels, dorsal fin slaps, pec slaps, spyhops, and tail slaps. They continued their rambunctious behavior as they started traveling again south down San Juan Channel, and quite frankly, they were behaving more like residents than Ts! The dark shoreline of San Juan Island made a perfect back drop for those huge blows! As the whales continued on towards Friday Harbor, we peeled off and went over to check out the wildlife on Spieden Island. 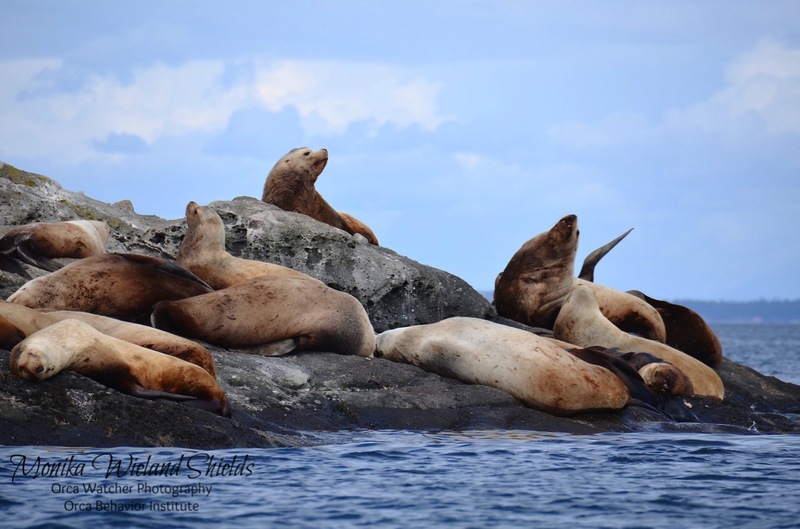 Amazingly, there were about 50 Steller sea lions at Green Point - 35 hauled out and easily another 15 in the water. 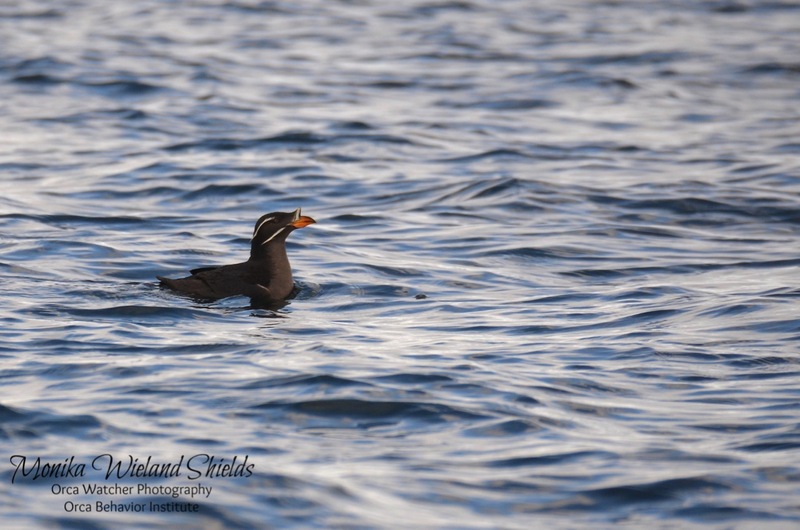 We also saw some good bird activity including pigeon guillemots, marbled murrelets, long-tailed ducks, pelagic and double-crested cormorants, harlequin ducks, and rhinoceros auklets. 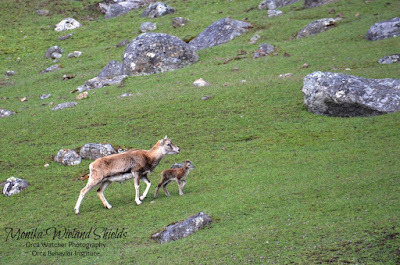 On the terrestrial side of things, the Mouflon sheep were out in full force on Spieden, and some females had some very young lambs in tow! 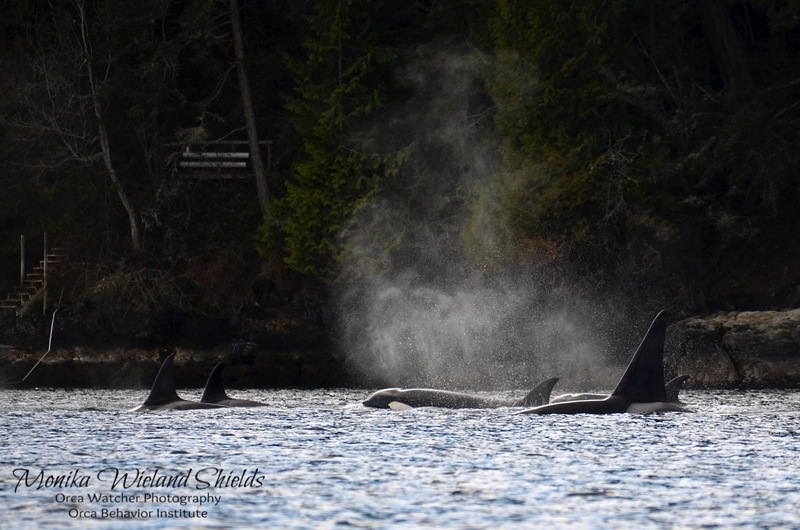 That all made for a pretty spectacular day, but late in the afternoon we got word that J-Pod was vocalizing on the Lime Kiln hydrophones. Where did they come from?! After listening to some great vocals we just had to head out there and take a look. 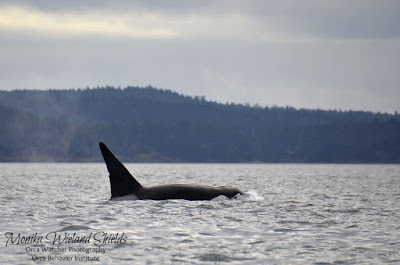 From Lime Kiln we spotted about 8 whales several miles offshore milling back and forth. 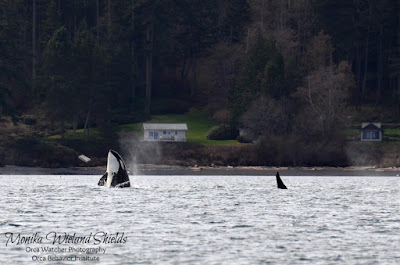 They were too far for photos, but any day you see both resident and transient killer whales is a pretty spectacular day! 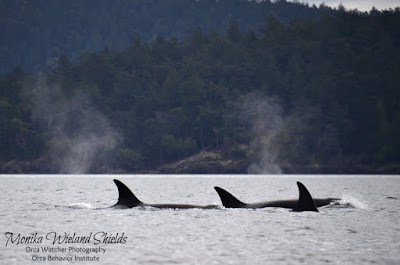 J-Pod has been around a fair amount in the last few weeks, not spending a lot of time here but transiting through the islands on a somewhat regular basis. My fingers are crossed that they keep it up and it turns into a whale-filled spring. It has certainly started out on a great note! 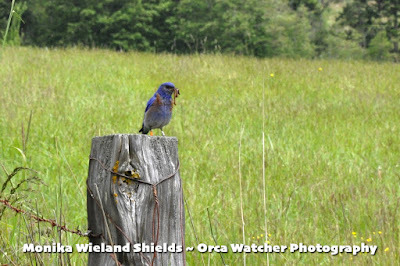 What's up with bluebirds on San Juan Island? Last night the San Juan Preservation Trust held a fireside chat about their western bluebird reintroduction project, which is entering its 11th year. Some people may wonder why this project is still going on and what it's future may hold. We learned answers to a lot of questions last night, and in case you weren't able to make it, I thought I would post a summary. There are historical records of western bluebird populations all throughout the greater Puget Sound region, including the San Juan Islands, from the 1800s into the early 1900s. Throughout the 20th century, however, primarily due to human development leading to habitat loss, many of this historic populations were extirpated. 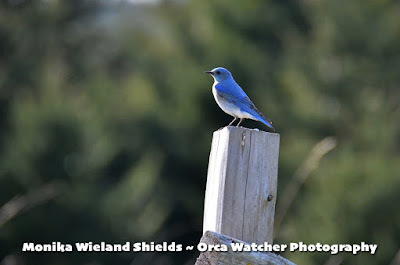 A strong population still exists near Olympia, but the large urban area of greater Seattle lies between that region and other areas that could still support bluebirds, like San Juan Island. 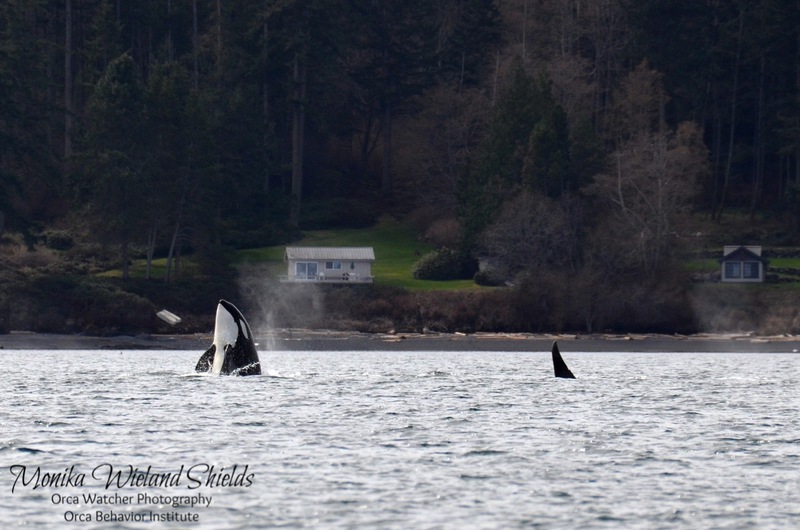 When you have patchy habitat like this, it's unlikely the birds will expand and re-find the San Juans on their own; what's their incentive to cross Seattle? 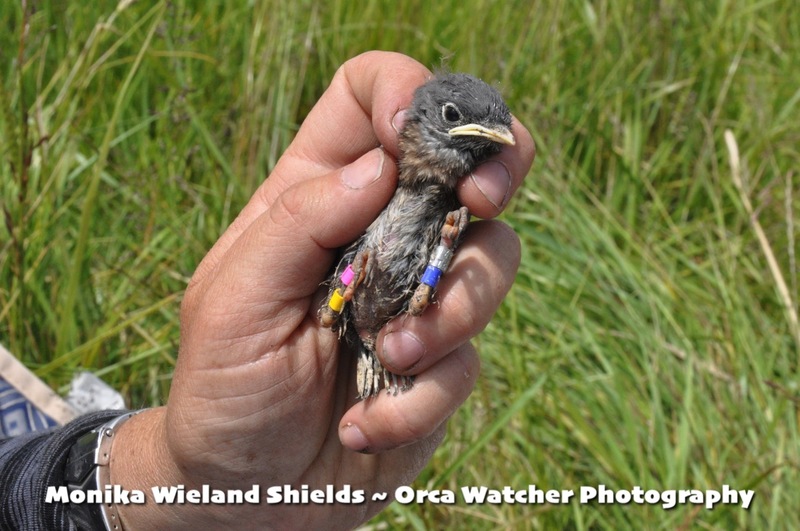 That's why the bluebird reintroduction project began, the first such effort for a migratory passerine species in the United States. 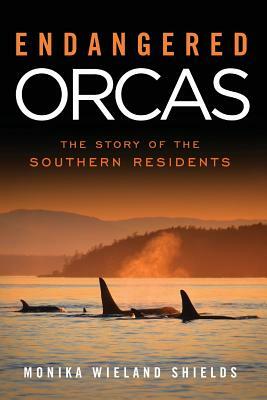 Relocation of birds from elsewhere in Washington happened over the first five years of the program, and a decent population took hold, having breeding success. Pairs and families who were "soft released" here after being held in aviaries were successfully breeding and rearing young, who were all banded so they could be tracked. 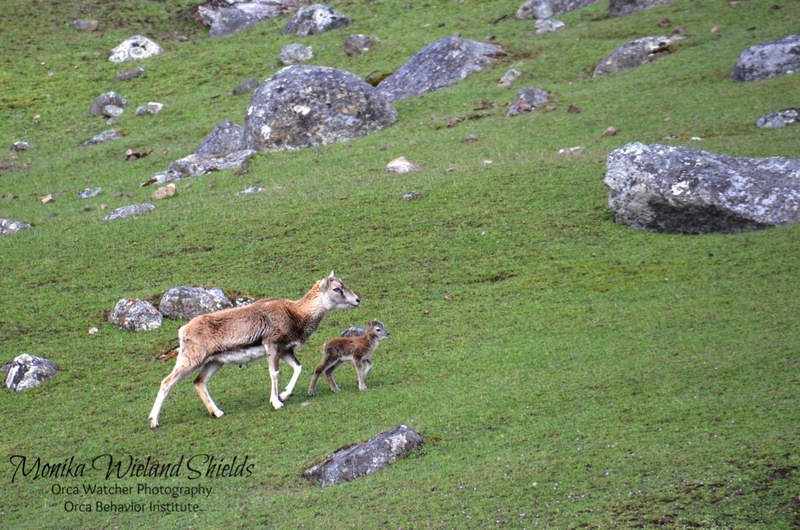 After five years of reintroductions, the program entered a two year monitoring phase to see if the population was healthy enough to maintain itself. Sadly, this coincided with two El Nino years that led to very wet springs, leading to a population crash of our newly established but still fragile population. Not only did these rainy springs take a toll on our bluebirds, but western bluebird and swallow populations throughout the state experienced big fatality events. It was terrible timing for the island's bluebirds, and emergency reintroductions were started again to help support the population. It was decided that five more years of supplementing the local population would occur, to see with better luck if they could gain a foothold. 2017 and 2018 are the last two years of this second round of reintroductions. So far, things are looking pretty good. A sister program in Cowichan Valley on Vancouver Island is helping bluebirds take hold in the region, and birds are beginning to move back and forth between these two pioneer colonies. The local population was about 30 birds last year, with one pair attempting to nest on Lopez Island for the first time. 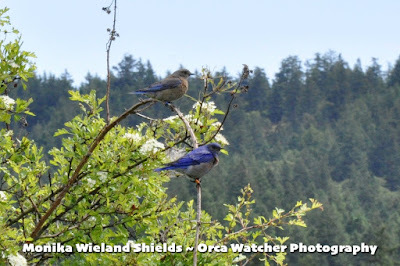 This past winter, for the first time on records, a small group of bluebirds actually overwintered on San Juan Island, being seen regularly on the west side and south end of the island, even despite our numerous cold snaps. If you see any bluebirds, or are interesting in helping out by volunteering in any of the above ways, please contact Kathleen Foley at kathleenf@sjpt.org. 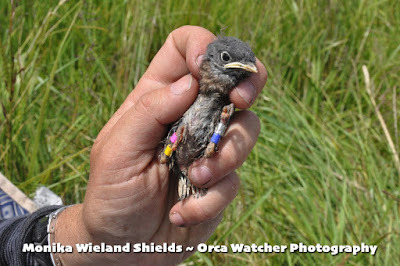 Please consider getting involved to help support the return of this beautiful little bird to the San Juans!